Mt. Hayachine｜Flower Garden｜Go! Go! Mountain!!! This mountain has lots of flowers, but there are no trees, therefore there is no shade to get away from the sun. Because of that I felt hot all the way up. Due to the terrain configuration, the cold winds always blow down the the valley and when the cool air goes up the mountain it forms clouds. This is why the weather in the mountain is often bad. Once you reach the ridge the weather conditions improve. At some points you have to use the ladder to climb, because the cliff is steep. But the ladder is not so tall, so it is safe to use. 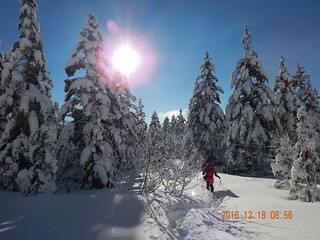 However, if you go there in winter you should be cautious because the mountain is covered with a lot of snow every winter. It was such beautiful scerney. I couldn't image before the climb how beautiful this mountain is. I couldn't expect how the view from the summit is splendid and beautiful. Especially the big stone named Gojoiwai made its atmosphere like a different world.